why CT scans are more reliable than ultrasound for diagnosis and staging. This article has been developed in association with Pancreatic Cancer Action. Pancreatic Cancer Action. UK Pancreatic Cancer Prognosis and Survival Rates. (accessed October 2016) Reproduced with permission. Pancreatic Cancer Action. Causes of pancreatic cancer. Reproduced with permission. Pancreatic cancer is difficult to diagnose because the symptoms of pancreatic cancer are often mistaken for those of other illnesses, such as irritable bowel syndrome. Yet it is crucially important that patients are diagnosed as early as possible because early diagnosis can increase the chance of a patient having surgery to remove the tumour—currently the only potential cure. At present, only around 10% of cases are eligible for resectional surgery.10 See Box 1 (below) for some key facts for medical professionals about pancreatic cancer. The traditional symptoms of pancreatic cancer are unexplained weight loss, abdominal pain, and obstructive jaundice. These, however, often appear in the advanced stages of the disease when cancer has spread. In order for patients to be diagnosed in time for surgery, it is important for medical professionals to spot the earliest symptoms. The frequency of specific symptoms is something that can be subject to interpretation, as the studies in Table 1 have shown (see below). The following symptoms may occur alone or in any combination11 (see also Box 2, below). the rare-attender who suddenly appears at the surgery, often in multiple visits, with unexplained weight loss, epigastric pain, and alteration to their bowel habit. NB Painless jaundice and/or new-onset dyspepsia demand an urgent diagnosis at any age. New onset, non-specific upper abdominal or back pain or discomfort is usually one of the first symptoms of pancreatic cancer and can often be overlooked by both patients and medical professionals. Upper abdominal pain may sometimes be postprandial due to duct obstruction. Jaundice suggests biliary obstruction or, very rarely, hepatic or hilar nodal metastases. Jaundice draws attention to tumours of the head of the pancreas (near the ampulla of Vater) at a relatively early stage. This means that these tumours tend to be more amenable to surgical resection. Patients with tumours of the body or tail of the pancreas tend not to experience jaundice until a fairly late stage of the disease. At this point, the jaundice is caused by metastases and the cancer is often inoperable. At an early stage, jaundice may be difficult to detect but liver function tests may be abnormal for several months before diagnosis. A change in bowel habit is common in patients with pancreatic cancer. Extensive infiltration of the pancreas or obstruction of the major ducts will also cause exocrine dysfunction, resulting in malabsorption and steatorrhoea. However actual symptomatic steatorrhoea is rare. Both heartburn and indigestion are independently associated with the risk of pancreatic cancer.18 Suspicion should be raised when patients do not respond to a course of proton pump inhibitor (PPI) treatment. A tumour in the pancreas can cause weight loss and a loss of appetite. Weight loss can occur at the early and late stages of the disease, and diabetes can result in rapid weight loss. Also key is the persistence of symptoms—symptoms such as unexplained dyspepsia, epigastric or back pain that are persistent (even in the absence of alarm symptoms should be considered important and the patient should be investigated for pancreatic cancer; clinicians should be aware that previous investigations which showed no abnormality (e.g. blood tests and even ultrasound scans) can provide both the clinician and the patient with false reassurance. The NICE guideline on Suspected cancer: recognition and referral21 (NICE Guideline 12) was updated in June 2015 and, for the first time, pancreatic cancer has its own section and combinations of symptoms and new-onset diabetes have been added (see Box 3, below). NICE is also developing a clinical guideline specifically on pancreatic cancer, which is expected to be published in January 2018. There are two markers that some pancreatic cancers may produce and which might be revealed following a blood test; these are CEA and CA 19-9. Serum CA 19-9 is more commonly used and is considered to be elevated when its value is greater than 37 U/mL (units per millilitre). CA 19-9 serum levels have a sensitivity and specificity of 79–81% and 82–90%, respectively, for the diagnosis of pancreatic cancer in symptomatic patients; but they are not useful as a screening marker because of low positive predictive value (0.5–0.9%).22 It is important to remember that not every patient with pancreatic cancer will have elevated CA 19-9, and some non-cancerous conditions can cause a high level of CA 19-9. While an abdominal ultrasound scan and endoscopic ultrasound can be used to discover a mass on the pancreas, contrast-enhanced CT-scans are one of the most reliable ways to diagnose pancreatic cancer; however, GPs rarely have direct access to them and usually have to refer patients to a specialist who may then order the scan. Primary care professionals may not fully appreciate the possibility of false negative results from ultrasound scans. Ultrasound scans are routinely used, however, so it is important to be aware that a normal ultrasound will often produce a false negative, which will not necessarily rule out pancreatic cancer. Sensitivity is compromised due to the location of the gland in a larger patient and/or in the presence of gas, and falls to about 30% for tumours <2 cm in diameter. Multi-slice contrast-enhanced CT scans, which have a sensitivity of 97%, are therefore the most useful investigation to diagnose and stage pancreatic tumours23 and, where specific symptoms exist, referral for a CT scan should be the first action. Even if the tests show a mass on the pancreas, that mass might be benign or a cyst so further investigation could be needed to confirm the diagnosis one way or the other. That further investigation will often include a biopsy to obtain a sample of tissue. for the rest, who do not have the option of curative surgery, chemotherapy can be an option depending on the stage of the cancer, fitness of the patient, and whether the patient wishes to have treatment. Research has shown that two-thirds of patients are underweight before surgery, but that survival improved significantly (164 to 259 days) when weight stabilisation was effectively managed.25 Identifying, advising, and managing this aspect of care can clearly make a huge difference to a patient's quality of life. FOLFIRINOX (i.e. folinic acid, fluorouracil, irinotecan, oxaplatin). In Scotland and Wales, nab-paclitaxel may be used in combination with gemcitabine for people with metastatic pancreatic cancer. Radiotherapy is used less often than surgery or chemotherapy in the treatment of pancreatic cancer but may be given—more information. Patients often need specialist help to determine dosage and nutritional advice to manage the symptoms of PEI. Once PEI symptoms are managed, patients are better able to maintain or gain weight. Patients will often require support with managing this condition and signposting to specialist advice. In 2015, GPs agreed that earlier recognition of symptoms would lead to earlier diagnosis.30 It has been shown that early detection leads to more patients having curative surgery and, as a result, their chance of surviving 5 years or more increases 10-fold; so GPs and other primary care professionals play a vital role in improving outcomes for people with pancreatic cancer. With just 3% of GPs feeling fully confident and informed about the symptoms of pancreatic cancer,30 empowering primary care teams to recognise the red-flag symptoms and respond proactively to patients experiencing unresolved and persistent symptoms is essential to achieving better outcomes for people with pancreatic cancer. 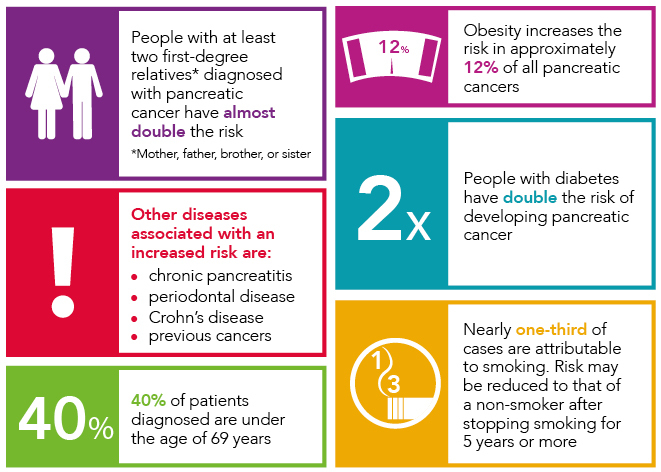 General practitioners can also encourage those patients who are at most risk of developing pancreatic cancer to maintain a healthy lifestyle to reduce their risk (e.g. by smoking cessation and maintaining a healthy weight), which could also make a real difference to improving survival rates. It is also important to be aware of the ongoing issues faced by patients with pancreatic cancer, given the fact that the majority will have advanced disease. Patients can be extremely unwell with chronic pain, loss of appetite, rapid weight loss, and fatigue. Patients and their families may also suffer from the psychological impact of pancreatic cancer, particularly with the poor prognosis. It can be challenging for GPs to deal with all these components and to alleviate patients' fears. General practitioners can also help by sharing their experiences (both positive and negative) in diagnosing pancreatic cancer with colleagues and CCGs, to inform best practice; 1-year survival rates can then perhaps begin to meet those of better performing regions and countries. A joined-up approach is essential to ensure that survival rates finally start to improve, to match those of other cancers. Research is also being developed into proteins in blood and urine.33 Unfortunately, a biomarker for use in clinic is a long way off and still needs significant research investment. With the advances in science taking place every day, we could afford scientists the window needed for early intervention; however, in order for us to do this, there needs to be development of a reliable diagnostic biomarker, particularly one that distinguishes between pancreatic cancer and pancreatitis. Some useful sources of information for practitioners and patients are shown in Box 4, below. Pancreatic Cancer Action produces a number of publications on pancreatic cancer. These can be viewed online or sent to a UK address free of charge. These publications are produced under the Information Standard certified scheme. Pancreatic cancer is often referred to as the 'silent killer' because it is difficult to detect in the early stages and difficult to treat in the late stages. There is still more work to be done to improve awareness among patients and healthcare professionals to optimise early diagnosis. Any advances, whether in diagnostics or treatments, made in the laboratory today could take up to 10 to 15 years to translate into the clinical environment and benefit patients. Therefore, GPs, who are most likely to be the first to encounter a person with pancreatic cancer, must make sure that they are aware of the risk factors and symptoms so that they can act quickly when a patient experiences these symptoms. This is especially important if the patient has a family history of the disease and/or if they are a rare attender now frequently visiting the practice. While research continues into better ways to detect and treat pancreatic cancer, better awareness and more proactivity among healthcare professionals will contribute to saving lives through early diagnosis in the short term. Clinicians can share their experiences (both positive and negative) in diagnosing pancreatic cancer with colleagues, to inform best practice. Pancreatic Cancer Action. Pancreatic cancer incidence and mortality in the UK. pancreaticcanceraction.org/about-pancreatic-cancer/stats-facts/incidence-mortality/ (accessed 13 October 2016). Pancreatic Cancer Action. UK pancreatic cancer prognosis and survival rates. pancreaticcanceraction.org/about-pancreatic-cancer/stats-facts/prognosis-survival/ (accessed 13 October 2016). 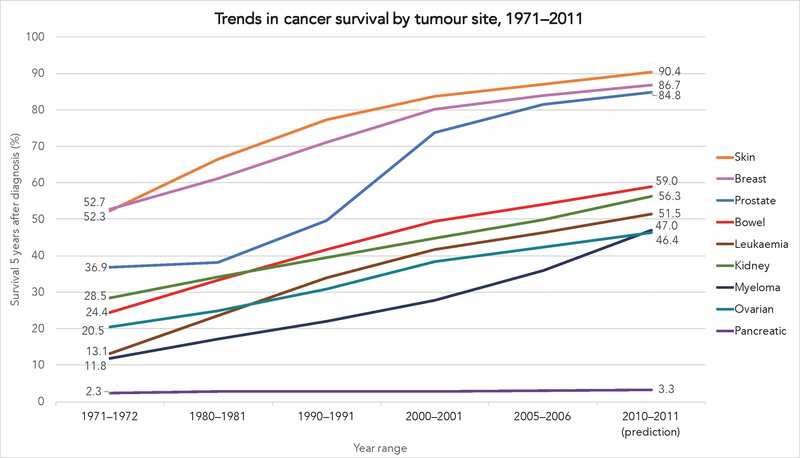 Mistry M, Parkin D, Ahmad A, Sasieni P. Cancer incidence in the UK: projections to the year 2030. British Journal of Cancer 2011; 105 (11): 1795–1803. Cancer Research UK. The 20 most common causes of cancer death in 2014. www.cancerresearchuk.org/health-professional/cancer-statistics/mortality/common-cancers-compared#heading-Zero (accessed 13 October 2016). Cancer Research UK. Selected common cancers, percentage change in European age-standardised mortality rates, persons, UK, 2010–2030. www.cancerresearchuk.org/health-professional/cancer-statistics/mortality/projections#heading-Three (accessed 13 October 2016). Pancreatic Cancer Action. Pancreatic Cancer Action patient and carer survey 2015. Available at: pancreaticcanceraction.org/wp-content/uploads/2015/08/Patient-and-carer-survey-2015.pdf (accessed 13 October 2016). National Cancer Research Institute. Data package—all data (Excel), spend by cancer site 2015. Available at: www.ncri.org.uk/what-we-do/research-database/ (accessed 13 October 2016). Ryan D, Hong T, Bardeesy N. Pancreatic adenocarcinoma (review article). New Eng J Med 2014; 371 (11): 1039–1049. Tomasetti C, Vogelstein B. Variation in cancer risk among tissues can be explained by the number of stem cell divisions. Science 2015; 347 (6217): 78–81. Pannala R, Basu A, Peterson G, Chari S. New-onset diabetes: a potential clue to the early diagnosis of pancreatic cancer. Lancet Oncol 2009; 10 (1): 88–95. Pancreatic Cancer Action. Pancreatic cancer symptoms & signs. pancreaticcanceraction.org/about-pancreatic-cancer/symptoms (accessed 13 October 2016). Pancreatic Cancer Action. Causes of pancreatic cancer. pancreaticcanceraction.org/about-pancreatic-cancer/causes-and-risks (accessed 13 October 2016). Pancreatic Cancer Action. Medical Professionals. pancreaticcanceraction.org/about-pancreatic-cancer/medical-professionals (accessed 13 October 2016). National Cancer Intelligence Network. Routes to diagnosis 2006–2013 workbook (a). Available at: ncin.org.uk/publications/routes_to_diagnosis (accessed 16 September). Public Health England. Routes to diagnosis 2006–2013 workbook (a) (overview of incidence metrics). Available at: ncin.org.uk/publications/routes_to_diagnosis (accessed 13 October 2016). Sultana A, Smith C, Cunningham D et al. Systematic review, including meta-analyses, on the management of locally advanced pancreatic cancer using radiation/combined modal therapy. Br J Cancer 2007; 96 (8): 1183–1190. British Medical Journal. BMJ best practice: pancreatic cancer (history and examination). bestpractice.bmj.com/best-practice/monograph/265/diagnosis/history-and-examination.html (accessed 13 October 2016). Hippisley-Cox J, Coupland C. Predictive effect of heartburn and indigestion and risk of upper gastro-intestinal malignancy. Br J Gen Pract 2012; 62 (596): 124–126. Pancreatic section of the British Society of Gastroenterology, Pancreatic Society of Great Britain & Ireland, Association of Upper Gastrointestinal Surgeons of Great Britain & Ireland, Royal College of Pathologists, Special Interest Group for Gastro-Intestinal Radiology. Guidelines for the management of patients with pancreatic cancer, periampullary and ampullary carcinomas. Gut 2005; 54 (suppl 5): v1–16. Schmidt-Hansen M, Berendse S, Hamilton W. Symptoms of pancreatic cancer in primary care: a systematic review. Pancreas 2016; 45 (6): 814–818. Ballehaninna U, Chamberlain R. The clinical utility of serum CA 19-9 in the diagnosis, prognosis and management of pancreatic adenocarcinoma: an evidence based appraisal. J Gastrointest Oncol 2012; 3 (2):105–119. GP Online. Pancreatic cancer. www.gponline.com/Clinical/article/772932/Pancreatic-cancer/ (accessed 13 October 2016). Bruno M, Haverkort E, Tijssen G et al. Placebo controlled trial of enteric coated pancreatin microsphere treatment in patients with unresectable cancer of the pancreatic head region. Gut 1998; 42 (1): 92–96. Davidson W, Ash S, Capra S, Bauer J. Weight stabilisation is associated with improved survival duration and quality of life in resectable pancreatic cancer. Clinical Nutrition 2004; 23 (2): 239–247. Cancer Research UK. Pancreatic cancer—chemotherapy for pancreatic cancer. www.cancerresearchuk.org/about-cancer/type/pancreatic-cancer/treatment/chemotherapy-for-pancreatic-cancer (accessed 13 October 2016). Toouli J, Biankin A, Oliver M et al. Management of pancreatic endocrine insufficiency: Australasian Pancreatic Club recommendations. Med J Aust 2015; 193: 461–467. British National Formulay. Pancreatin. Available at: www.evidence.nhs.uk/formulary/bnf/current/1-gastro-intestinal-system/19-drugs-affecting-intestinal-secretions/194-pancreatin/pancreatin (accessed 13 October 2016). Cui Y and Andersen D. Pancreatogenic diabetes: special considerations for management. Pancreatology 2011; 11: 279–294. Pancreatic Cancer Action. GPs dub it the ‘silent killer’ yet just 3% say they are fully confident in recognising symptoms. pancreaticcanceraction.org/news/gps-dub-it-the-silent-killer-yet-just-3-say-they-are-fully-confident-in-recognising-symptoms/ (accessed 13 October 2016). Yachida S, Jones S, Bozic I et al. Distant metastasis occurs late during the genetic evolution of pancreatic cancer. Nature 2010; 467 (7319): 1114–1117. Mahipal A, Frakes J, Hoffe S, Kim R. Management of borderline resectable pancreatic cancer. World J Gastrointest Oncol 2015; 7 (10): 241–249.